#046 registered N805RA - Kaman K-1200 A94-0046 is now registered as N805RA with Rotak Helicopter Services and is joining the sisterships N357KA and N803RA in their fleet. 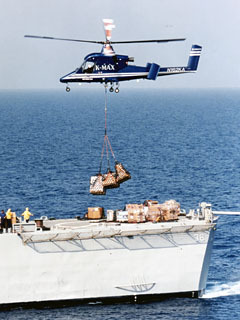 #042 - #046 produced - Five further Kaman K-1200 K-Max are produced andpartially deliverted to the US customers Rotak Helicopter Services, Helicopter Express Inc and Columbia Basin Helicopter. #005 back in the air - Kaman K-1200 K-Max A94-0005 has been rebuilt and is back in the air as N116 with Central Copters Inc. The company is now operating a total of 4 K-Max, all in the spectacular red-black bubbles colors. #041 registered HB-ZTW - Kaman K-1200 K-Max A94-0041 is now registered as HB-ZTW with Rotex Helicopter. The company is operating since 20 years Kaman K-1200, now a fleet of total 3 K-Max. Resumed production - The first K-1200 of the resumed production recently had it's first flight. Two new K-Max are ordered by Lectern Aviation China and one by Rotex Helicopter Switzerland. 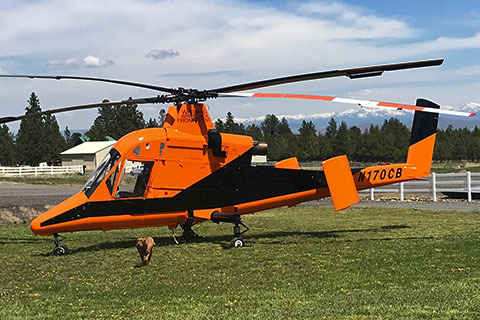 3rd K-Max for Central Copters - Kaman K-1200 N115 previous registered as HL9168 with Lucky Air joined the fleet of Central Copters Inc of Bozeman MT. It has been repainted with the same paint scheme as N314 and N414. #025 back in the air - Kaman K-1200 N675TH of Timberline Helicopters Inc now has already a little over 100 flight hours since rebuild. Timberline Helicopters purchased this helicopter from Mountain West Helicopters in 2007, between January 2008 and June 2011 completed a re-build of the aircraft from its accident in Prineville Oregon in 2000. N134WC crashed - Kaman K-1200 K-Max N134WC of Woody Contracting Inc. was destroyed on June 16, 2010 during logging operations near Donnelly, Idaho. Unfortunately the pilot did not survive this tragic accident. My deepest sympathy goes to the familiy and friends of the pilot. 1st NZ registered K-Max - Skywork Helicopters just registered # 029 as ZK-HEE and painted it in the eyecatching company livery. St.Louis Helicopters goes K-Max - St.Louis Helicopters of Chesterfield, MO is now operating K-Max # 029 N358KA previous operated by US Department of State. #006 with 22'000 flight hours - K-Max N134WC of Woody Contracting reached 22,000 flight hours 14th of August 2008 on the Deep Draw fire in Elmo Montana. K-Max videos - A nice video of K-Max HB-ZEH working in Valais/Switzerland by Jean Etienne Allet can be seen on You Tube as well as a video of St.Louis Helicopters K-Max knocking down a chimney with a wrecking balls. #007 with 15'000 flight hours - K-Max C-FXFT of Heli Qwest passed 15,000 flight hours on the 18th of June 2008. Rainier Heli-Lift with STC for new carbon fire tank - On June 15th 2007, after three years of design and development work, Rainier Heli-Lift and Isolair Inc. received an STC for their new carbon fiber fire-fighting fixed tank. Rainier, operating K-MAX N699RH, flew the tank for the first time on November 16th 2006. Isolair Inc. the designer and builder of the tank will also be building and selling additional tanks to other K-MAX heavy-lift operators. The new 700-gallon carbon fiber tank weighs less than 500 pounds and is powered by a 50-HP hydraulic pack that pulls power from an accessory pad off of the transmission. The tank is a two-piece U-shaped tank design that keeps the weight high up on the airframe surrounding the center of gravity of the aircraft.It takes two mechanics 2.5 hours to remove the trolley system and attach the tank to the load-bearing beam. This quick installation gives the K-MAX the flexibility to rapidly switch from a long-line vertical reference heavy-lift platform to a tanked fire-fighting machine.